(Colorado Springs, Colo.) – Team USA will travel to Montreal this week to compete in the Pan American Championships – the final international event before the Senior World Championships are held in July in Leipzig, Germany. The six-day competition is one of four Zonal Championships being held around the world in June with the African Championships taking place in Cairo, Egypt (June 8-12), followed by the European Championships in Tbilisi, Georgia (June 12-17) and the Asian Championships in Hong Kong (June 15-20). Not only will each of these Zonal Championships help determine seeding for Senior Worlds, but athletes on the top-16 bubble will have an additional level of pressure as they seek to remain among the top 16 to advance directly to the table of 64 in Leipzig. Team USA will fence athletes from 25 nations with more than 200 fencers scheduled to compete in Montreal. The six-day event will be held at the Centre Pierre Charbonneau in the Olympic Park which was home to the 1976 Games. The U.S. team dominated the field at the 2016 Pan American Championships, winning 13 individual and six team medals, including nine total golds. The Star Spangled Banner has played every year since 2011 at the conclusion of the men’s foil event with Race Imboden (Brooklyn, N.Y.) and Gerek Meinhardt (San Francisco, Calif.) winning three titles each. After winning gold at the 2011 and 2015 Pan American Games, Alexander Massialas (San Francisco, Calif.) claimed his first Pan American Zonal title in 2016. Massialas would go on to win individual silver at the Olympic Games and bronze in the team event with Imboden, Meinhardt and Miles Chamley-Watson (New York City, N.Y.) While Chamley-Watson has not won an individual Pan Am title, the 2013 Senior World Champion holds four individual Zonal medals. The international field includes several athletes who will attempt to challenge the U.S. squad with Daniel Gomez (MEX) returning to the event after defeating Chamley-Watson, his former Penn State teammate, in the semis last year. A top-eight finisher at the Olympic Games in his home nation, Guilherme Toldo (BRA) is aiming to return to the Pan Am podium for the first time since winning bronze in 2014. Between the two of them, sisters Courtney and Kelley Hurley (San Antonio, Texas) hold five Pan Am titles with Courtney winning gold in 2009, 2013 and 2014 and Kelley coming in as the reigning Pan Am Champion after winning her first title at this event in 2011. The 2012 Olympic team bronze medalists will be joined by Rio Olympian Kat Holmes (Washington, D.C.) who has won silver or bronze at every Zonal Championships since 2013. Holmes also took gold at the Pan American Games in 2015. Anna van Brummen (Houston, Texas) won bronze at her first Pan Ams in 2014 and will be fencing at her second career Zonals following a gold medal win at the Suzhou World Cup last fall. Ranked No. 13 in the world, Nathalie Moellhausen (BRA) is considered to be one of the top threats to the Americans. A former Senior World medalist for Italy, Moellhausen won gold at her first Zonals representing Brazil in 2015. Leonora McKinnon (CAN) won her first senior international medal at the 2015 Pan Ams with a bronze and will be competing in front of a home crowd after competing at the Rio Olympic Games as a 22-year-old last year. Rio Olympian Jason Pryor (South Euclid, Ohio) won silver at the 2016 Zonals and took bronze in 2013. This year, Pryor and 2012 Senior World Team Champion Ben Bratton (New York City, N.Y.) will be among the fencers aiming for gold in Montreal. Their teammates, Adam Rodney (New Orleans, La.) and Cooper Schumacher (Parsippany, N.Y.), will be fencing at their first Zonals, but both could be ready for an upset after top-32 results on the World Cup circuit this season. Cuba is only sending one fencer to Canada, but Yunior Reytor Venet could bring home his second Pan Am title after taking gold in 2016 and winning silver at the Vancouver World Cup in February. The Limardo brothers from Venezuela also are among the favorites for podium finishes. 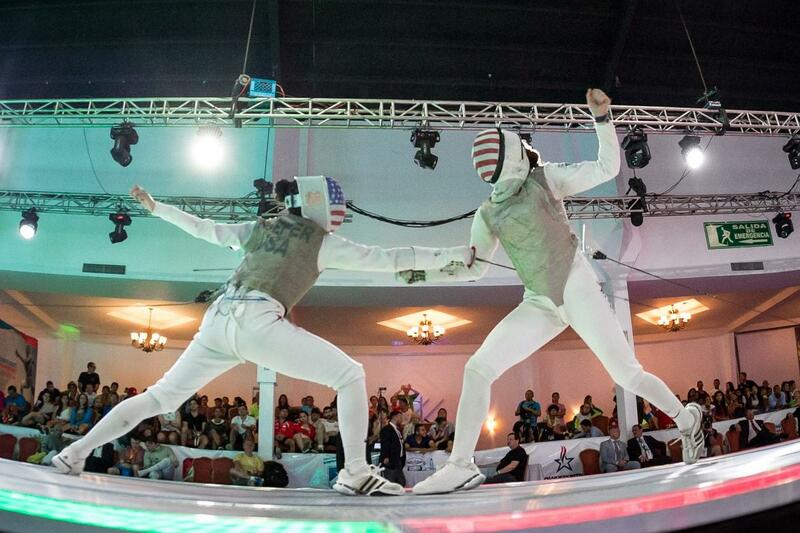 The eldest brother, 31-year-old Ruben Limardo, won his nation’s first fencing title at the Games in 2012 and holds Pan Am titles from 2009 and 2015 as well as six total individual Pan Am medals. Thirty-year-old Francisco Limardo won the 2014 Pan Am Championships and placed third in 2015 while 21-year-old Jesus Limardo is making his Senior Pan Am debut in Montreal. A U.S. fencer has won gold in women’s saber at the Pan Ams for 10 of the last 11 years with Mariel Zagunis (Beaverton, Ore.) holding six of those titles. The only non-U.S. fencer to have stood on top of the women’s saber podium was Maria Belen Perez Maurice (ARG) who took gold in 2014 and now holds a No. 14 world ranking. Following Zagunis’ withdrawal from the team as she recently announced that she is pregnant and due to have a baby girl this fall, the event is open for a host of potential champions. Last year, Ibtihaj Muhammad (Maplewood, N.J.) won her first Pan Am title after Zagunis withdrew at the break during the finals. Muhammad will be returning for another chance at gold this year along with two of her teammates from the squad that won bronze at the Rio Games – Dagmara Wozniak (Avenel, N.J.) and Monica Aksamit (Matawan, N.J.) Wozniak won five individual Pan Am medals from 2010 to 2015, missing the podium last year due to injuries. Aksamit, who won bronze at her first Pan Ams in 2009, earned a top eight finish when she returned to the event in 2016. A 2014 Senior World Team Champion, Eliza Stone (Chicago, Ill.) is returning to her fourth Pan Ams after winning silver in 2013 and bronze in 2015. The Overall Junior World Cup Champion in 2014, Paola Pliego (MEX), won bronze at the last two Zonal Championships and is among the event’s top prospects for a podium finish. Alejandra Benitez (VEN) has had one of her best recent seasons on the World Cup circuit, earning top-16 finishes at three of the last four tournaments. At 36 years old, the four-time Olympian is seeking to return to the podium at the Pan Ams for the first time since winning bronze in 2013 after earning top eight finishes in the last three years. Both members of the 2016 U.S. Olympic Team have won gold at this event in past years with Rio Olympic silver medalist Daryl Homer (Bronx, N.Y.) winning the 2011 Pan Am gold and his teammate, Eli Dershwitz (Sherborn, Mass.) taking the 2014 and 2015 titles. London Olympian Jeff Spear (Wynantskill, N.Y.) won silver at his first Zonals in 2012 and bronze in 2015. A bronze medalist in the team event at the 2014 Junior World Championships, Geoffrey Loss (Laguna Beach, Calif.) will be fencing for the first time as a member of the Senior National Team after a season that included a top 32 result at the Cancun Grand Prix and a silver medal finish at the Division I Nationals in April. Venezuelan Jose Quintero broke through at the 2016 Pan Ams where he brought home a bronze medal after winning the Junior Pan Ams earlier that season. After a full season on the senior circuit, Quintero will be one to watch in Montreal. Joseph Polossifakis (CAN) won his sole Pan Am medal with a gold in 2012, but fell shy of the podium in subsequent years with a pair of top eights in 2015 and 2016. After representing Canada at the Olympic Games, Polossifakis has taken much of this year away from international competition, but has the potential to reach the medal stand in front of a home crowd. In 2010, a 16-year-old Lee Kiefer (Lexington, Ky.) made her Pan Am debut and has effectively made this event the Lee Kiefer Show ever since, winning an unprecedented seven straight gold medals. While Kiefer has had her best international season yet, reaching a career-high World No. 1 in March, her teammates have also had new levels of success and are aiming to have the Stars and Stripes raised for someone new this year. Now ranked No. 4 in the world, London Olympian Nicole Ross (New York City, N.Y.) won three international medals this season and earned six top eight finishes. Ross finished second behind Kiefer in 2015 and 2016 at this event, but the matches against her friend and teammate have always remained close. Margaret Lu (Greenwich, Conn.) won bronze at her first Pan Ams as a 19-year-old in 2013 and will be competing for just the third time as an individual at the event this year. Lu, who won her sixth Division I National Championship in April, has had one of her best seasons to date, earning a top-eight result at the Absolute Fencing Gear® FIE Grand Prix Long Beach in March after a close loss to Kiefer in the quarters. Sabrina Massialas (San Francisco, Calif.) earned top eight finishes in both of her past appearances at the Pan Ams, falling to Kiefer in the quarter-finals of the 2015 Pan Ams and Canada’s Alanna Goldie last year. The Canadians are poised to be Team USA’s greatest threat in Montreal. Eleanor Harvey (CAN), a two-time Junior World silver medalist, made waves at the Rio Olympic Games with her upset of former World No. 1 Arianna Errigo (ITA) in the table of 16 and has since risen to No. 6 in the world. A podium finish in Montreal would help the 2016 NCAA Champion for Ohio State bolster her career-high ranking. Alanna Goldie, a four-time NCAA First-Team All-American for Ohio State, has been one of Canada’s most consistent fencers at this event, winning bronze in three of the last five years. Kelleigh Ryan is also one to watch as a two-time medalist who finished second behind Kiefer in 2014 and placed third in 2016.